This study will explore organizational communication interactions among employees of New Jersey schools and social work staff supporting adolescent parents. The main focus of the study is a program known as Project TEACH (Teens Education and Child Health), which sponsors year-round alternative high school programs for pregnant and parenting teenagers across the state. As part of its central mission, the program "strives to make sure that each student will receive a diploma from her local high school or return to their local school districts to complete their education" (State of New Jersey, n. pag.). There are presently six Project TEACH sites in the State, serving students between the ages of 13 and 21. In order to be eligible, students may not have completed high school and must have been referred by local school districts. In addition to providing education in small classroom settings, the program provides case management services, helping to link teen parents to community resources and ease their transitions into the community after completion of high school. - First, how effectively are organizational communications used to delineate professional boundaries, develop a shared sense of mission, and prioritize expenditures of resources? - To what extent are competing bureaucratic cultures at stake, and how are formal or informal channels of communications (including e-communications) used to negotiate bureaucratic hurdles? - To what extent does a shared, coherent narrative of pregnant and parenting teens and their needs emerge through these communications? And what is that narrative, or the competing narratives that exist? In order to provide a theoretical apparatus for this inquiry, the review approaches two key bodies of scholarly literature. First, the literature on organizational communications is surveyed with an eye toward understanding the importance of culture, complexity and contestation in organizational communications. Second, the literature on bureaucracy is explored in order to understand the types of unique communications issues that may arise in a public sector context. The field of organizational communications studies has been in great flux over the past several decades. As first solidified in work by Shannon and Weaver, organizational communication studies were a little bit akin to the study of the childhood game of "telephone," in which a message is repeated down a line of participants, and the final message is then announced (usually to amusement). In other words, Shannon and Weaver concentrated to a great extent on unidirectional communications-how one person delivers information through a select channel to a receiver who then decodes the message. The model also took into account various types of "noise" that might interfere with transmission and decoding. Noise is any force that interrupts the transmission of the message as formulated by the original sender. However, the basic model presupposed that if the channel were clear, then the message should be received and decoded appropriately. Feedback was also present in the model, however, there was a strong emphasis on this type of unidirectional communication. [Communication is a process where there is a mutual assignment of meaning, simultaneous responses by all persons in the transaction, ongoing giving and receiving of multiple messages, circularity, and numerous channels of communication)]. Berlo's step forward in acknowledging the complexity of organizational communications is particularly important when considering the complexity of communications within and among governmental entities, which not only are subject to deeply entrenched (and sometimes conflicting) cultures, but where aggressive attempts to regularize communications are only matched by aggressive doubts about the efficacy of those communications, and attempts to circumvent prescribed channels. Building on Berlo, newer models have only increased the focus on nuance and complexity in organizational communications, in part due to the influence of postmodern and poststructuralist approaches within the academy overall. For instance, scholars have explored how meaning is constructed within organizations (Berger, 2008, n. pag. ), an effort which not only confounds the unidirectional approach implicit in early work on organizational communications, but which places emphasis on the irrationality and unpredictability of communications processes. Tretheway and Ashcraft have even incorporated notions of paradox and irony into their study of organizational communications. Their approach is founded on recognition of the exponentially increasing complexity of organizational structures, cultural inputs and communication channels. As "organizational environments become more complex and turbulent, and as diverse institutional forms merge and emerge," they note, "organizations and their members are pulled or are purposefully moving in different, often competing directions" (Tretheway & Ashcraft, p. 81). Thus the researcher must become attuned to multiple strains of meaning and the playful and also subversive potentials of various communication channels. Building in part on Tretheway and Ashcraft, scholars such as Bach have also noted that the tensions and multivalence of organizational communications leave room for intentional or unintentional marginalization of certain organizational actors. In this event, the field of communications becomes something of a battleground; emphasis is placed on tension over playful subversion or irony. Bach pays particular attention to the way that communications can be used to "other" specific people or ideas. "Resigning someone or something to the status of other is a form of disenfranchising, discounting, or marginalizing that person or process" (Bach, 2005, p. 259). Bach tracks othering through the narratives of Institutional Review Board applications-a process of application to a bureaucratic decision-making body within one's own organization. In this regard, her work may have particular resonance for the present study, in which "application to" specific authorities within either agency is a routine part of program management. In breaking free from the early frameworks, scholars have also begun to come to grips with the power of informal communications within organizational contexts-i.e., the infamous "grapevine." For instance, Crampton, Jodge and Mishra have noted that four factors tend to increase grapevine activity, including: the attachment of high importance to a particular communication; lack of clarity in organizational communications from managers to employees; an organizational environment that is "unsecure or threatening" (n. pag. ); and lack of trust by employees in the formal communications channels. (Intriguingly, although the grapevine can become a powerful force in the transmission of information and messages, Crampton, Jodge and Mishra  found that 92.4% of companies they surveyed had no formal policies to deal with rumors and grapevine communications, and managers typically take a hands off approach in dealing with these informal communications networks [n. pag.]). In part, the increasing complexity and diversity in organizational communications studies simply mirrors real processes on the ground, as Tretheway and Ashcraft (2004) have noted. A major stimulant in this respect has been the explosion of organizational use of internet and new media channels. Such channels not only create multiple, and fast-paced official flows of information, but they stimulate unofficial circulation of information such as rumor and innuendo (Borden & Harvey, 1998). There is evidence, as well, that increases in virtual presence (e.g., through telecommuting) can destabilize trust within organizations and make it harder to establish effective teams. This erosion of trust, moreover, is a two-way process. The more a particular employee's presence is established through virtual means, the less others may trust that individual; conversely, an employee working remotely or communicating with the organization largely through virtual means may find herself feeling isolated and "becoming fearful" (Green & Roberts, n. pag.). Unfortunately, the literature appears to be largely silent on the distrust that may be generated between users who possess various degrees of comfort with information technology. This issue may prove to be particularly interesting within government agency contexts, where employees typically have long tenures and coworkers may come from vastly different "digital generations" and cultures. In sum, organizational communications studies have come a long way since early work by Shannon and Weaver. Their work provided a basic heuristic for understanding that the life of the organization depends to a large extent on, and can be viewed through, specific instances of communication from sender to receiver, Organizational success depends on the minimization of noise and the clear receipt and decoding of such communications. However, as Berlo (1960) and the vigorous scholarship that has followed recognize, emphasis on the unidirectional line from sender to receiver may shortchange the true complexity of how communications "happen" in organizational environments. Communications are subject to organizational and individual cultures; they are fraught with tension and potential for subversion (Tretheway and Ashcraft); and they can be used to "other" individuals or people, becoming sites of contestation. Informal communications, which in previous models may have been treated as noise, have come into focus as a distinct subset of organizational communications, and the prevalence of new channels-internet and new media-creates new opportunities for efficiency and clarity, as well as new opportunities for mishap and breakdown of trust. All of these factors contribute to a holistic understanding of organizational communications not merely as specific acts or instances, but as part of competing attempts within organizations to construct meaning. Above all, what new directions in organizational communications studies have indicated is that context matters. Therefore, it is impossible to frame communications within and among government agencies without understanding the specificities of bureaucratic organizations. Therefore, the next portion of this literature review turns to scholarship on bureaucracy. The sociologist Max Weber (1947) famously postulated that government bureaucracy represented a pinnacle of human efficiency. Weber had an intense interest in the ability of modern societies to suppress the irrational, inefficient or fantastic; in state bureaucracies he saw the potential to wring inefficiencies out of human transactions. He wrote, e.g., that "the purely bureaucratic type of administrative organization [is] capable of attaining the highest degree of efficiency and is in this sense formally the most rational known means of carrying out imperative control over human beings" (Weber, p. 337). Doubtlessly, however, the more prevalent view of bureaucracy, as Katz & Danet bluntly noted, is that it is "inefficient, inhuman, and inaccessible" (p. 392). "In everyday conversation, to call something "bureaucratic" is to damn it. Bureaucracy implies red-tape, long lines, elaborate forms . . ." (Katz & Danet, p. 3). This is no less true, according to some observers, for agency employees themselves. In particular, there is often a breakdown between 'front line' workers and management in attitudes towards bureaucratic structure. Wilson, for instance, has described the tendency for front line workers to view managers as overly concerned with classifications and procedures, thereby slowing down the actual work of the agency and rendering it more cumbersome (p. 137). Managers, for their part, may perceive front line workers as "loose cannons" who do not understand the necessity of bureaucratic classifications and procedures to ensure equality of treatment and excise politics from the work. As Katz & Danet point out, the general role of social scientists is to view bureaucracies as neither efficient nor inefficient (at least not as part of a generalized, a priori stance) but rather to study bureaucracy as a specific type of social organization used to further specific goals (p. 3). Nevertheless, there is a good deal of empirical evidence testifying to the fact that public organizations suffer from more work delays based on administrative red-tape than do private sector organizations. Moreover, the insight that agency workers themselves may struggle with internal forms of red tape opens a specific line of inquiry into organizational communications: how do workers communicate about shared frustrations? Where are the breadowns in terms of critique (e.g., management versus staff, one agency versus another)? What patterns and channels of communication are used to address inefficiencies? Whether inefficiencies are perceived or "real" it is important for the researcher in the agency setting to remain attuned to the role that frustration with bureaucratic inefficiencies plays in the communications strategies of employees. Just as in the field of organizational communications, the increasing presence of information technology in the lives of government agencies has spurred a distinct line of research. First, it should be noted that information technology is marshaled very unevenly both among and within various agencies (Seifert & McLoughlin, 2007). Among the states, for instance, there is often a disjuncture between the centralization of web portal services, which simplify access to basic agency information and routine paperwork for consumers of governmental services, and the actual use of IT in the organizational, outreach and decision-making efforts of individual agencies and programs. Research by Pandey and Bretschneider suggests that there are also varying levels at which government organizations will view IT as instruments for promoting efficiency in the work of the agency. Unless an organization is already employing new information technologies to perform key tasks, they may not perceive such technologies as a tool for improvement This poses important issues when researching agency communications and choice of channel, particularly when-as here-two or more agencies are involved in programming, which presents the possibility that they will be unevenly committed to new technological strategies. The literatures on organizational communications and on bureaucracy help to frame approaches to the present research problem. 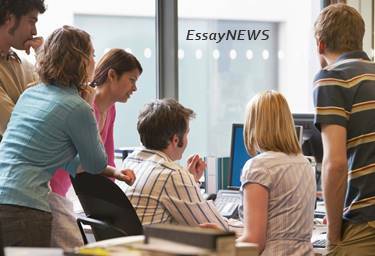 Within organizational communications, recent scholarship has several important implications. First, it would be foolhardy to attempt to isolate and explore individual pieces of communication in order to understand what the sender meant and whether the message was properly decoded. Rather, the organization's communications must be understood as a complex phenomenon that implicates culture, narrative, contestation, and strategies for othering. Channels for communication have become more complex; simultaneously, informal means of communication such as gossip, which may have been perceived as noise in earlier research paradigms, now are recognized as comprising a fundamental part of the organization's overall communications culture. Meanwhile, the literature on bureaucracy suggests that perceived inefficiencies both impact, and are negotiated through, organizational communications. Different agencies may have different ways of doing things. When two or more agencies are involved in a given project, a variety of communications strategies may come into play-ranging from grapevine griping to use of new Information Technologies. There are clear methodological implications inherent in the literature. A multi-layered approach may well represent the researcher's best hope for grasping the complex and overlapping forms of organizational communications that are bound to arise with regard to a program such as Project TEACH. At a minimum, it would seem that both ethnography and open-interview format would be vital to capturing the meaning -making that is accomplished through organizational communications, and for understanding how the program's goals might best be met. Therefore, the next section turns to Methodology. Bach, B. W. The organizational tension of othering. Journal of Applied Communications Research, 33(3), 258-268. Berger, B. K. Employee/organizational communications. Berlo, D. Process of communication: An introduction to theory and practice. New York, NY: Harcourt School. Borden, D. L. & Harvey, K. The electronic grapevine: Rumor, reputation, and reporting in the new on-line environment. Mahwah, NJ: Lawrence Erlbaum Associates. Green, D. D. & Roberts, G. E. Personnel implications of public sector virtual organizations. Public Personnel Management, 39(1), 47+. Katz, E. & Danet, B. Making organizations work for people: Strategies for innovation and change. In E. Katz & B. Danet, (Eds. ), Bureaucracy and the public: A reader in official-client relations (392-404). New York, NY: Basic Books. Harris, T. E. & Nelson, M. D. Applied organizational communication: Theory and practice in a global environment. Mahwah, NJ: Lawrence Erlbaum Associates. Pandey, S. K. & Bretschneider, S. I.The impact of red tape's administrative delay on public organizations' interest in new information technologies. Journal of Public Administration Research and Theory, 7(1), 113+. Retrieved from Questia. Seifert, J. W. & McLoughlin, G. J. State E-government strategies: Identifying best practices and applications. Congressional Research Service. Shannon, C. E. & Weaver, W. Mathematical theory of communication. Champaign, IL: University of Illinois Press. Trethewey, A., & Ashcraft, K. L. Practicing disorganization: The development of applied perspectives on living with tension. Journal of Applied Communication Research, 32, 81 - 88. State of New Jersey. Project TEACH. State of New Jersey. Connecting government with the people. Weber, M. The theory of social and economic organization. (A. M. Henderson & Talcott Parsons, Trans.). New York: The Free Press. Wilson, J. Q. Bureaucracy: What government agencies do and why they do it. New York: Basic Books. US-based social school editor and researcher.